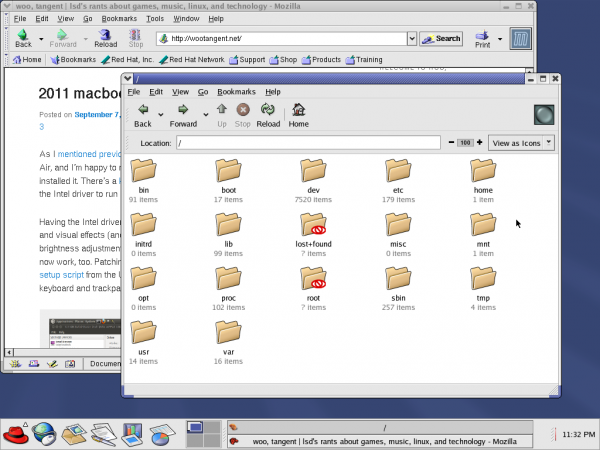 This entry was posted in Linux, Rants and tagged desktop, gnome, gnome 2, gnome 3, unity by lsd. Bookmark the permalink. A sensible look at G3. The 1.4->2.0 vs. 2.x->3.0 perspective you propose is interesting. You’re right: we didn’t lose so much, we gained in simplicity and overall “sense”, and the few missing cherries will be back on the cake soon. Out of curiosity, which distro do you use / are you planning to use? – I find it harder and harder to use Ubuntu, because their deep Unity-focused modifications to -uh- everything end up impacting/cluttering the GNOME3 experience. I’ll be curious to see just what happens to GNOME 3 in Ubuntu 11.10 — it should be in the repositories and just not installed by default, so hopefully it’ll be easy enough to install a few packages and bring up a complete GNOME 3 desktop. If that becomes more difficult as Unity becomes more ingrained in the Ubuntu experience, though, then I too might be looking for a new distribution. 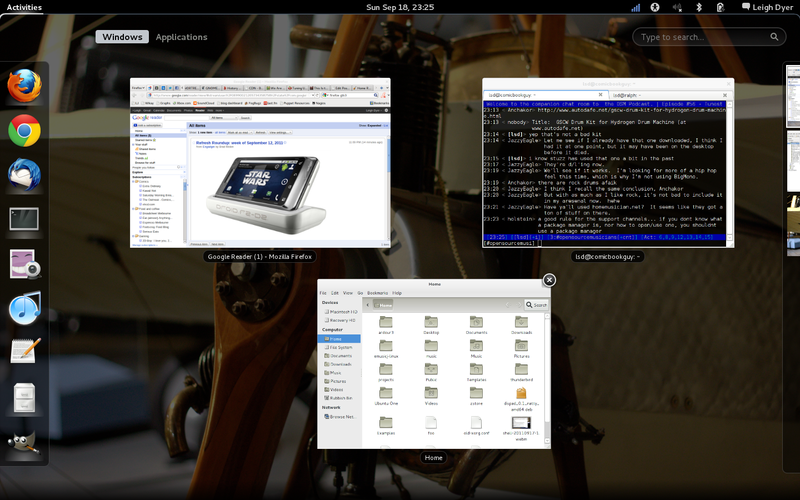 Like you, I have been using Gnome 3 for about 2 weeks, and I’ve been very pleasantly surprised. I’ve found it an excellent laptop distro, and the big buttons and keyboard accessible views and menus suit how I use my laptop very well. I have also installed it on my 3yo netbook, and it has worked well on that too, despite the machine having minimal hardware resources. 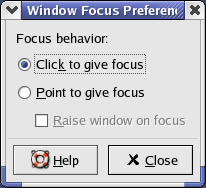 There are some niggles, and the option to configure basic things easily is a PITA, like setting file associations within the ‘open with’ dialogue, not being able to remove the accessibility button, not being able to auto-hide the task bar, and auto-login settings being ignored. Overall though it works well, especially for a *.0 release, and I must say that it looks really, really good! I think you may have hit the nail on the head, actually — I too think it’s an excellent desktop for laptop users, and I wonder if that might be part of the reason why reviews of it have been so mixed. I’ve yet to try it on my dual-monitor desktop PC, but I’m starting to think that it would fare less well there. I’m sticking with Ubuntu 10.10 on my desktop for now anyway, because I know it works for me, but hopefully by the time I’m ready to move on from that, GNOME 3 will have matured enough to be very usable on desktop systems, too.